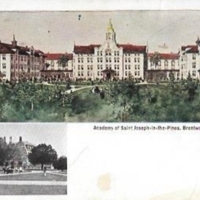 Postcard featuring two views of the Academy of Saint Joseph-in-the-Pines, one in color (top) and one in black & white (bottom). The color image contains an exterior view of the school as seen from a distance. The black and white image depicts two horse drawn carriages traveling away from the school. 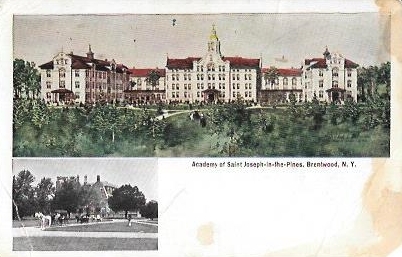 Illegible, “Academy of Saint Joseph-in-the-Pines, Brentwood,” Hofstra University Library Special Collections: Digital Collections, accessed April 23, 2019, https://omeka.hofstra.edu/items/show/1602.